Canola is attracting pests and diseases like any other crop that is produced and this can have a notable effect on the canola yield. The insect that is seen most of all is the plant aphid, while the most problematic insects are the larvae of the diamondback moth and bollworm. Several diseases could play a role during the production season. Blackleg can cause severe damage and must be controlled early in the season. White leafspot and Alternaria can cause problems, but the occurrence is usually very intermittent. Scleriotinia has emerged as a disease with severe yield losses over the past four seasons. The question is thus, do I have to apply control measures and if so, when? We want to apply control measures at a stage when the cost of the control measure is less than the damage it could cause – thus at a stage where it makes economic sense. We call this point a threshold value. 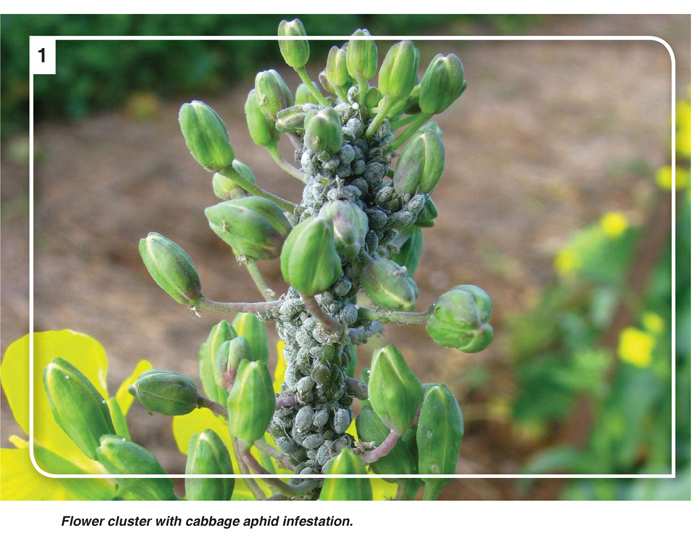 Aphid infestation is more prevalent at flowering. Canola is, however, very susceptable to aphid damage early in the growth season, especially from emergence to the rosette stage. The flowering phase of the plant already starts from middle July onwards and can continue until middle September, depending on the area where it is produced. If aphids attack the plant during the rosette phase it can hamper the growth of the plant. If the infestation is heavy and long lasting during the flowering stage and pod formation, it can affect seed set and podfill negatively (Photo 1). Cold conditions slows the build up of aphid populations. A guideline for control measure application is that 20% of plants need to be infested. The top 2 cm to 3 cm of the stem must be covered in aphids. Regular inspection is necessary during the flower and pod phases of plant growth. 4 tot 5 larvae per square metre. Scout canola fields from flowering stage onwards. 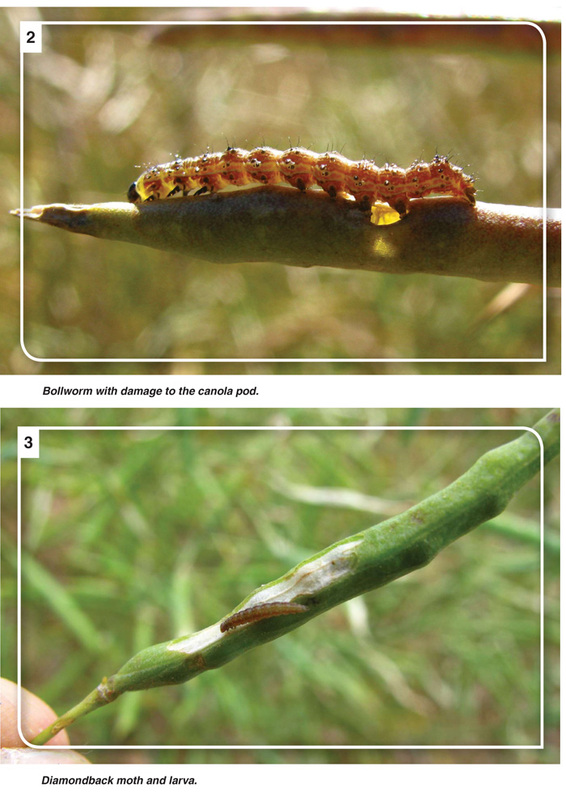 The diamondback moth is the main insect problem in canola and other cabbage crops worldwide (Photo 3). If canola is planted in areas where other cabbage type crops are also planted, the problem could be more threatening. The larvae are heavily underrated and cause more damage than we think. The severity of the problem differs from area to area and from season to season. It has the ability to develop into a serious problem in the Western Cape and therefore control is important. They can also feed on weeds like wild mustard and can migrate over long distances. The insect can develop resistance to insecticides and alternating the chemical products is advised. The larvae cause the most damage in warm dry seasons. Rainfall of 5 mm to 8 mm in a 24-hour period can lower the population dramatically. In early winter, numbers are low and gradually increase as the season progresses and can go through three to five generations per season (Table 1). Threshold values for control measures are shown in Table 2. The climate of the Southern Cape is especially conducive to the development of this disease and it occurs regularly. During the 2016 season, it was also more noticeable in the Swartland. Scleriotinia not only infects canola, but can also attack several other crops. Lupin is one of these crops that is highly susceptible and is produced on a large scale in the sandier areas of the Swartland. Weeds like devil’s thorn and wild mustard also counts as hosts for the disease. Legumes, such as peas and Faba beans, are less susceptible (Photo 4a and Photo 4b). Moisture is very important to the development of the disease. High soil moisture, along with light rain during the two-week period before the commencement of flowering, and also during the flowering period, will increase the risk for development of the disease. Dry climatic conditions will hamper the development of the disease. Chemical control of the disease will be optimal at the flowering stage when 20% to 30% of the flowers have opened. The disease can cause yield losses of 0,5% per 1% of infected plants. 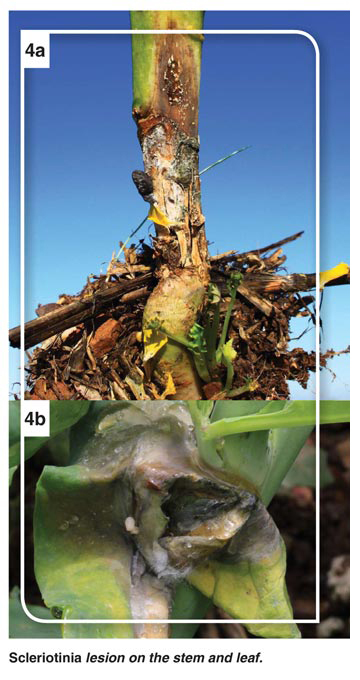 The yield loss of a 1% infection in canola crop where a yield of 1,5 t/ha is expected is 75 kg (@R6/kg = R450). To ensure optimal yield potential the insect pests and diseases prevalent on canola must be monitored and controlled at the correct times. Article submitted by Piet Lombard and Dr Johann Strauss, Directorate Plant Sciences, Programme Research and Technology Development Services, Western Cape Department of Agriculture. For more information, send an email to pietl@elsenburg.com. or johannst@elsenburg.com.